autothrall, can you PM me the contents of your review please? I want to test something. It's giving me a 404 error when I try to PM to you, so I've included the text below. Thanks for the assistance. Though never the most reticent of metal bands, Italy's Children of Technology really wear their hearts on their sleeves so boldly that the bloodstains will never come off in the wash, no matter what super strength detergent used in the purge. A colored chrome logo proudly transforms the group's logo into something belonging to the past, giving impressions of Razor or other such 80s blitzers, and the 7" EP's title of Mayhemic Speed Anarchy provides a blunt summary for those not yet in the know about their retro pandering style. This is a band courting a hybrid of punk, speed and thrash metal aesthetics which has generated a healthy chainsaw buzz through the underground in the past few years, and the tracks here are in no rush to break the mold whatsoever, which is business as usual, and what many are no doubt looking for in their sound. "Mayhemic Speed Anarchy" is thus pretty standard fare for the Italians, a wall of forceful, brazen punk chords pumped up to early 80s metallic acceleration and woven through with crazy fits of lead work and corrosive gutter bark vocals redolent of the crossover splatter titans of the past, complete with screams that recall old Razor or Slayer in their petulant sense of infectiousness. The drums and bass are simplified and streamlined to accompany the narrow selection of riffing, but I enjoyed the pumping low end tone and the rather thrown-together, authentic feel of the beats nonetheless. Problem is there just isn't all that much here, and the main guitar progressions feel as if they've just been paraphrased from numerous crossover/punk influences and barely spiced up beyond the leads. This is energetic, propulsive stuff fit for a circle pit, but it never really goes beyond that, and I found it inferior to a number of tracks from It's Time to Face the Doomsday, their first proper full-length from 2010 which was pretty good. I definitely derived an aesthetic appeasement from the tune, but it's not catchy enough for many replays. The B-side is better, but that comes with a caveat that it's a cover of Swedish punks' "Computer World" (from their 1989 album Faces of Death). The riffs are again pretty straight punk rock, but there's a bit of natural dissonance to the chords which gives it an almost archaic Teutonic aggression. I also really dug that unhinged wildness of DeathLörd Astwülf's pavement scraping growls and grunts here, and the band's frivolous solo work complements the momentum of the original rhythm guitars. Of course, I was already a fan of this original tune, so I'm probably a bit biased in its favor, but Children of Technology manage to have some fun with this and make it their own due to the vocal variation. All told, Mayhemic Speed Anarchy isn't a bad little 7" if you're in the mood for a collectable, or if you enjoy C.O.T. for their past works, but with just around 7 minutes of content, it wouldn't be a great starting place for newcomers, who could make a b-line for It's Time to Face the Doomsday or the Chaosmutant Hordes EP. Gahhh... okay, I know what's causing most of these issues now. There was recently a security update to cPanel (our server control panel software), but it's been triggering way too many false positives. 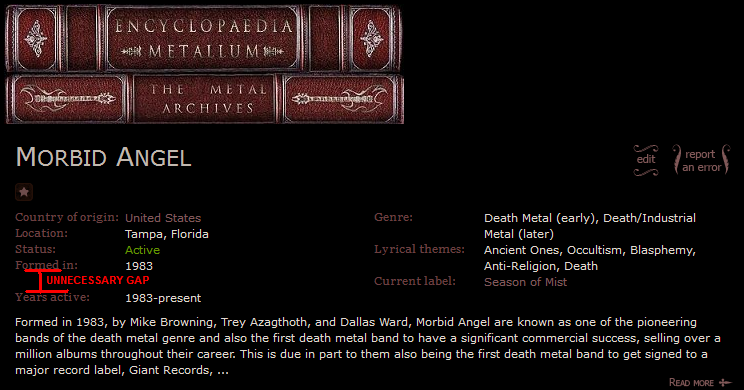 Some keywords in the contents you guys have posted (autothrall's reviews, some song lyrics, etc.) triggered the security script and blocked you from posting. That's also the reason why autothrall could post his review on the forum but not through the site or through a PM, because that security script included an hard-coded exception for forum posting (:lol: I kid you not). I've tweaked the security script myself to prevent most of the false positives. Anyone who's had problems submitting reviews, lyrics, or any kind of data, please try again now. HB broke that recently , but I noticed it myself a few minutes ago. Should be fixed. Workin' like a charm now! Much obliged. Can there be an optional entry on albums for record speed? I'm constantly running into 7"'s that are 33rpm and also 12" records that are 45rpm records. Or should this just go into the additional notes? This will probably be a part of the planned multiple release versions/pressings feature. For now, additional notes, yep. Can anyone direct me on how to add boxed set to a bands discography? For boxed sets, you will not have to enter the tracklisting, but rather, the name of each disc, and their total playing time (optional as always). In place of the lyrics field, you can add notes about each disc (including the tracklisting, if the disc has some special tracks). Well, How do I add this Morri? You don't. It's an upcoming release and the exact release date is unknown so you don't add it until you have this information. Edit: well, Alhadis said the band frontman told you it was released today. Okay, fair enough, but I'm still not sure if it's a valid release... we're discussing that in the secret ninja mod chatroom at the moment. If it's acceptable I'll add it myself. Edit 2: also, this isn't about a bug or anything like that, this should have been posted here, really. Well, I can be lame at times..Sorry for the inconvenience. I posted here because I couldn't find the exact thread.. 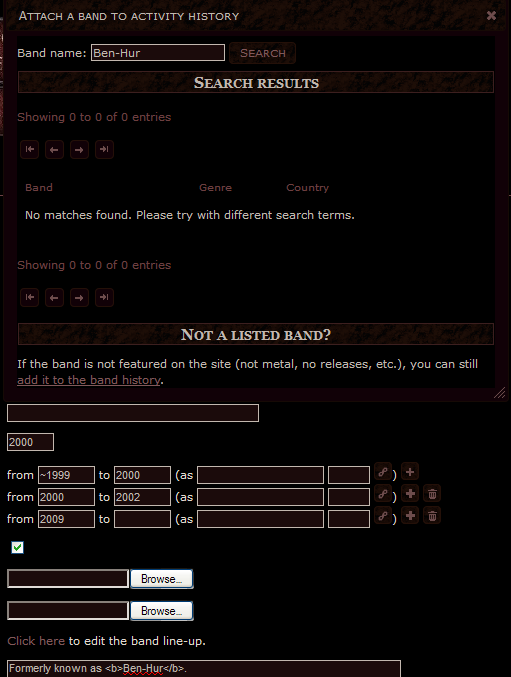 It should be listing "Ben-Hur" in that name field, not simply placing the number 0 in the Band ID field. It's not a critical problem, since you can still just manually type the band name in, but the fact remains that that button is essentially useless at the moment. Ok that's odd. I'll look into it. Last edited by Alhadis on Mon Dec 17, 2012 6:51 am, edited 1 time in total. Setting the minimum year of birth to 1908 seems kinda haphazard... maybe set it to 1900 so it's rounded off to a nice, curvacious multiple of 10? Besides, within a decade or two, we'll be seeing some classic heavy metal artists in their 80s/90s. This is something that I noticed sometime back. When a user quotes another user's post, there's no mention of the date and/or time of the quoted post. This can get a bit confusing and tiresome to see the date-reference if you have a long thread. Did you guys debate about removing it out? I feel that while it can be a bit trivial to some, it can be an innocuous added feature which will provide some sort of reference to readers. You're looking for this thread. Anyway, that's part of the phpBB3 forum software we use, not sure if much can be done about it. Personally, I think it's not a problem. Add it manually if you prefer? See, from this page you can't tell whether the live drumming for Вал'кирия is a present role or a past one (it's the latter). Perhaps there should be division tabs that say "Current" and "Past", like there are for the live tab on band pages? Hmm, yeah looks like that's a bug. Points apparently are not given for uploading cover arts. It's been added to the bug tracker. MalignantThrone's thing too. Some instrumental tracks have texts in their lyrics box, e.g. this album. When you click "instrumental" tag, you can read the text, but when you click "hide lyrics", the tag becomes "show lyrics", not "instrumental". Please fix this bug. ...Really, someone actually cares about that? Not really a bug, but something that probably needs attention regardless...When you add an international band and add members to it, if those members aren't connected to any other bands, then their country of origin is listed as "International", which is silly. Is it possible to, say, remove that "country" from the list of those available for artist countries of origin, and have it default to "N/A" when members are being added to an international band? That only affects a few artists. You can just manually change their country. I've got some sort of an error when trying to look at the ninth page of the reports, probably there is some unreadable symbols? Fine for me. I'm using Aurora (alpha build of Firefox). In regards to Zodi's post here, he deleted the year of formation field, but the years active field is still filled in. I can't delete it, either. Edit: Nevermind. OOGBOOG was being dumb again. Last edited by oogboog on Mon Dec 31, 2012 11:07 am, edited 1 time in total. Huh, weird, I couldn't remove it either. EDIT: Nevermind, it's gone. There was a "bin" icon next to the "Years active" field which removed it. Look at #56 under Most Wanted, which is a split between Belkètre and Vlad Tepes, but the album is listed as only being by Belkètre. Really liking the new policy on band approvals. Hopefully there will be less people crying about dir en grey every couple weeks now that they're listed as unacceptable in plain sight. Also, when might we see an advanced search for artists? That would be incredibly useful.